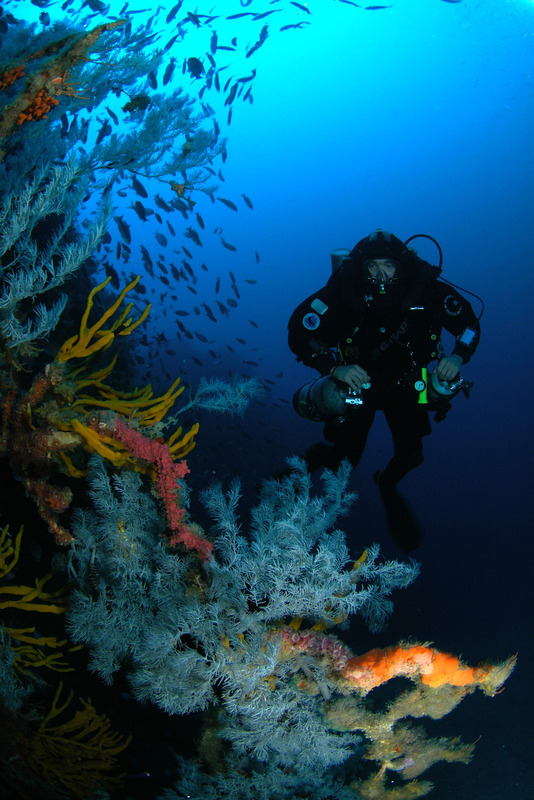 Northern Arch is perhaps the signature dive of the magnificent Poor Knights Islands. The bottom of the arch itself is at 37 metres but deeper water is close by. Swimming out of the arch to the south, the sandy bottom begins at 45 metres and gradually slopes away. The northern side of the arch gives better access to deep water with a jumble of enormous boulders quickly dropping down to the sand at around 65 metres. Some small black coral trees can found in this area starting at around 45 metres. 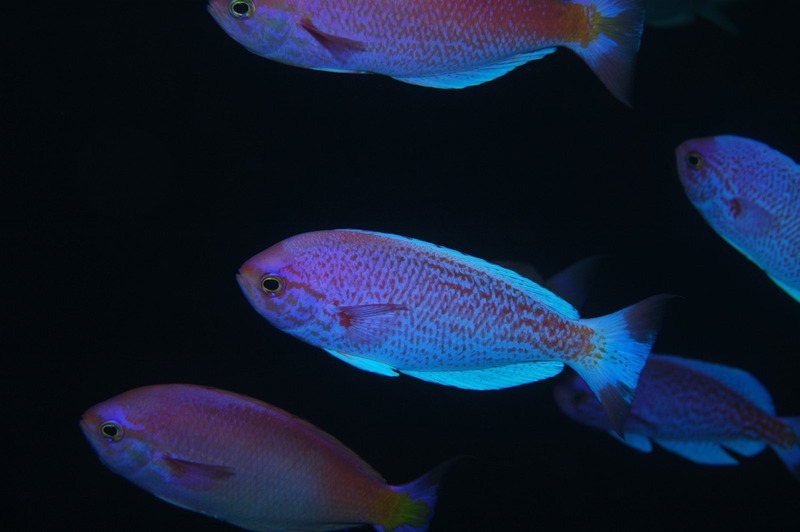 Foxfish (Bodianus sp.) 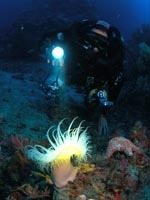 can occasionally be seen lurking beneath the boulders below 60 metres. 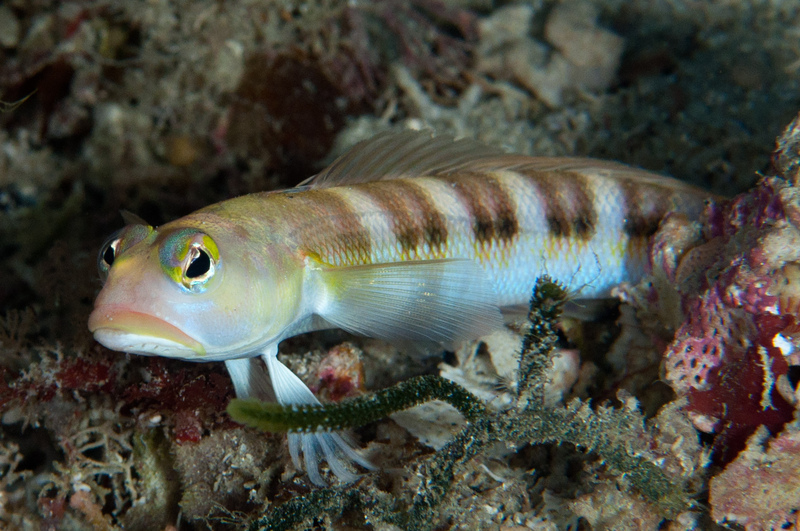 A deep water relative of the blue cod, the redbanded weever (Parapercis binivirgata) can be found on patches of sand. Heading to the west from the northern side of the arch towards the point, two large overhaning rock faces are encountered at about 60 metres depth. 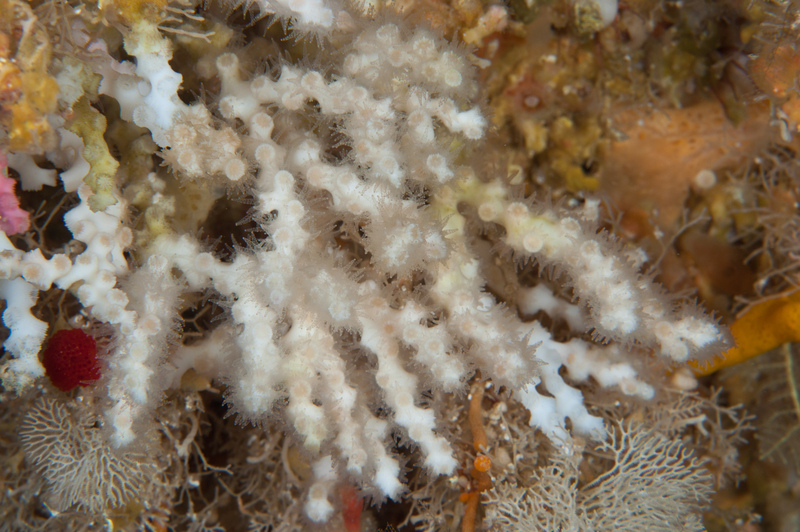 These are festooned with the precious ivory coral, Oculina virgosa. 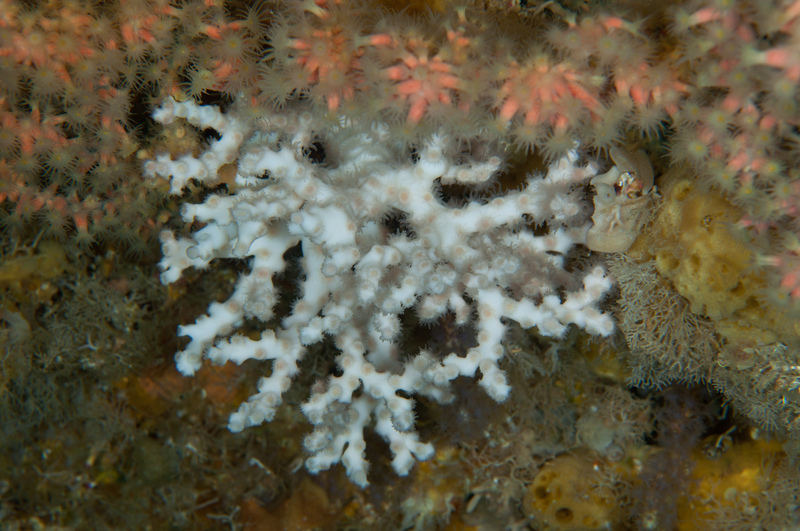 Unlike Oculina at the Three Kings Islands which appears orange in colour, these coral colonies are mainly white with patches of pink. 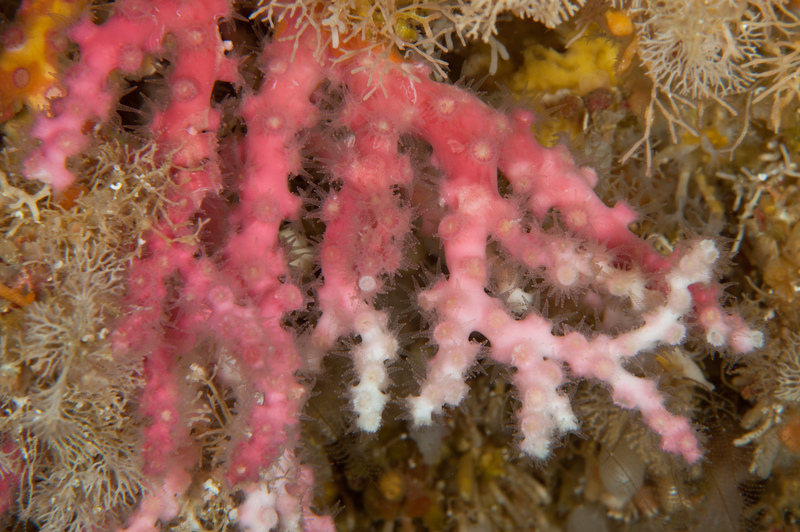 At the first patch, the coral is coloured pink and white. At the second, it is almost completely white. A heavily encrusted scooter sits on a ledge at 62 metres a little to the north and west of the arch. At the point off Northern Arch, the wall plummets in one of the finest vertical descents at the Knights. In places, the wall is almost shear to the sand at 80 metres. Elsewhere, a jumble of huge boulders can be found at 70 to 75 metres leading down to the sand. 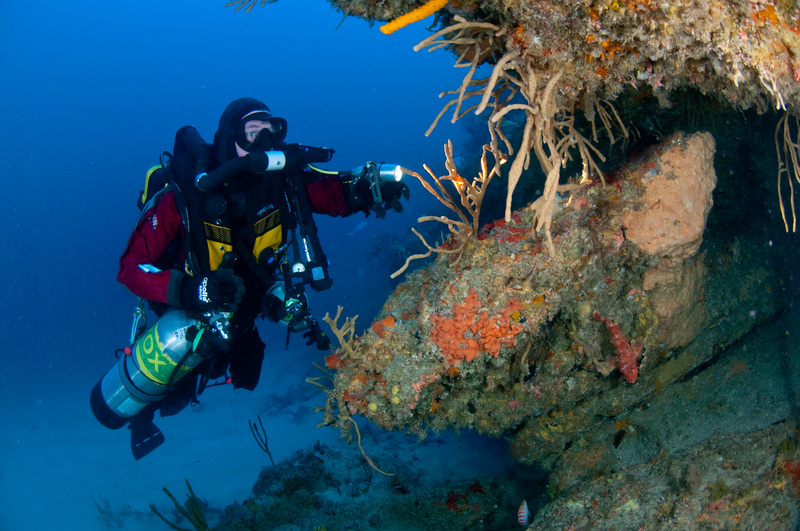 The point is a good place to start a dive allowing an easy elevator ride down to the desired depth from where divers can head north and east towards the arch, gradually ascending as the sandy bottom rises up and the vertical rocky wall becomes less steep. 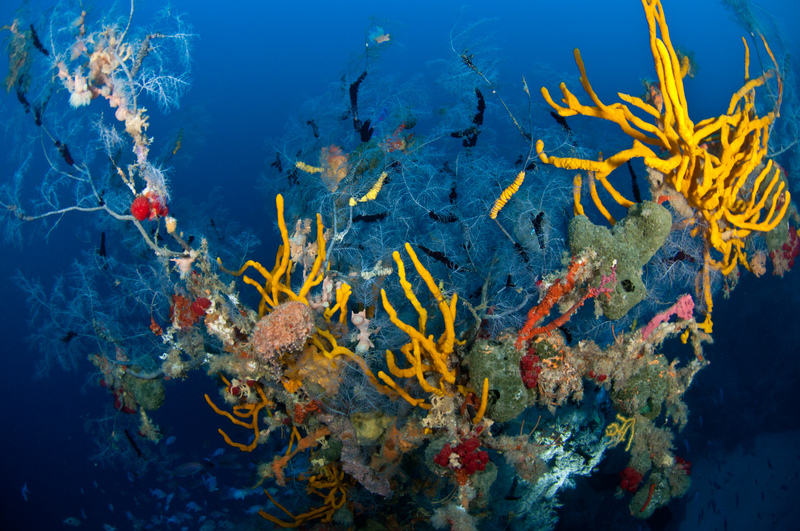 There are remnants of what must have once been majestic black coral trees at 70 metres, their dead branches now festooned with encrusting sponges. 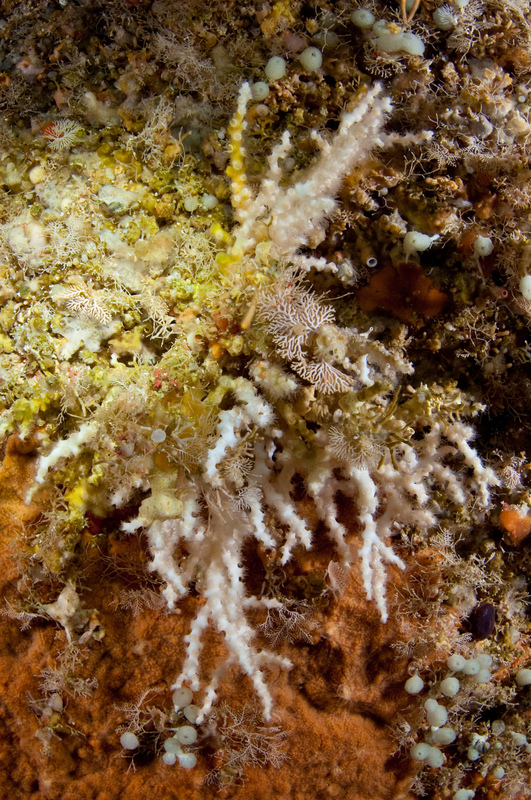 The deep wall is covered in the usual yellow finger sponges and Primnoides gorgonian fans. Some small black coral trees branch out from the wall but they are not a major feature of this area. The walls to the north of the arch receive more direct sunlight and are the better side to spend time decompressing. 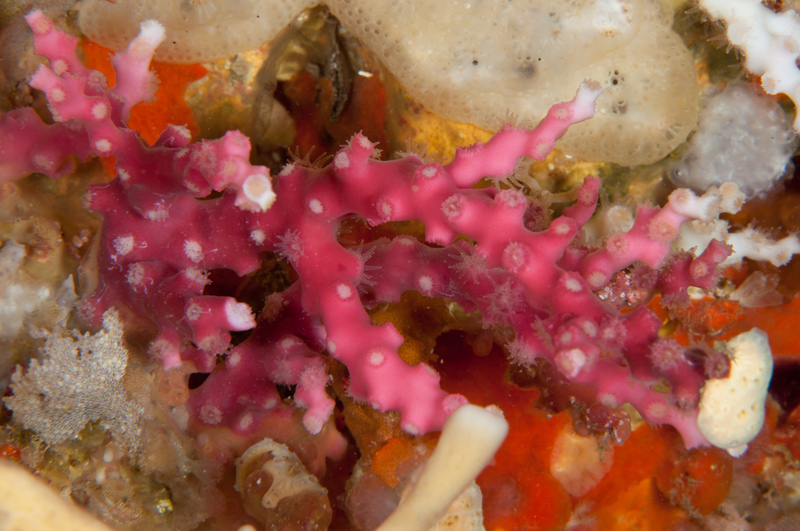 Rich encrusting life grows in the shallows which are a productive area for finding unusual tiny nudibranchs. 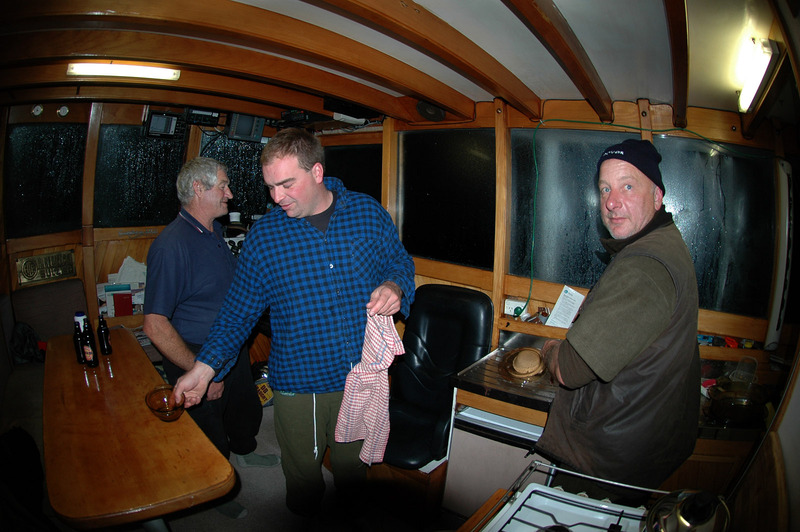 The anchorage is well sheltered from southwest weather and the site is suitable for divers of all levels. 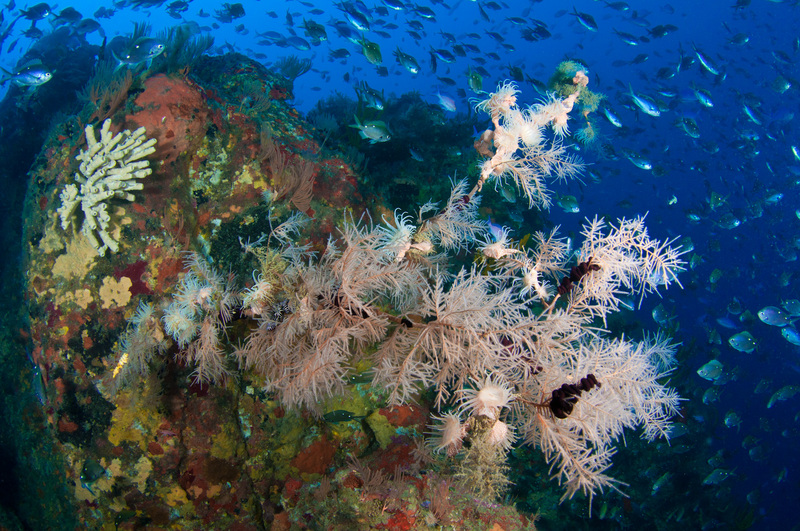 After a short swim towards the point, divers can descend down the pretty wall which is covered with gorgonian fans. 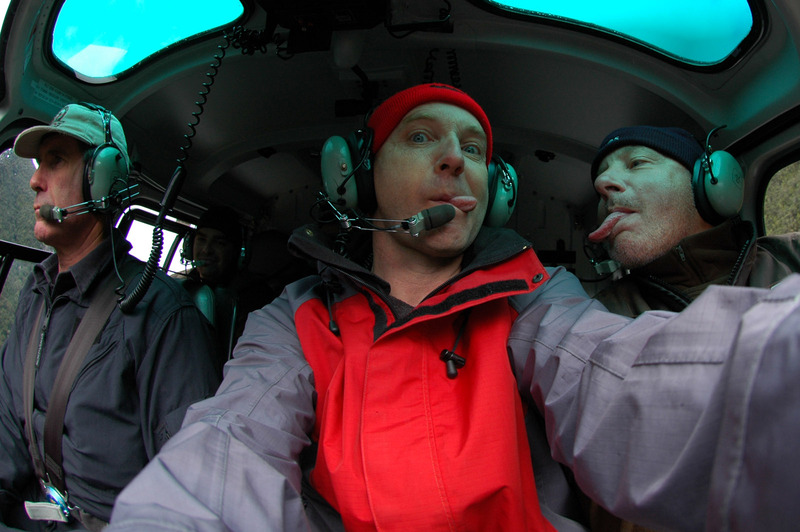 The descent continues by dropping down over a series of huge boulders. Sandy patches between the boulders are reached at around 60 metres depth where an enormous boulder, the size of a double garage appears from out of the gloom. On the outside of this boulder, it's overhanging faces are cloaked in white Oculina at around 67 metres depth. The boulder sits on other large rocks and there is a swim-through underneath it. 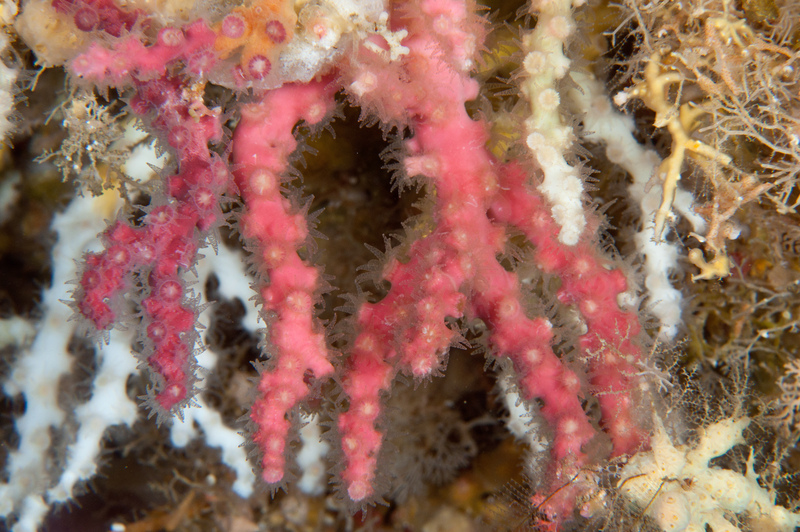 Pink coloured clumps of Oculina can be found on vertical rock faces close to the sand which is reached at a depth of about 73 metres. Look out for a large organ-pipe sponge in this area. 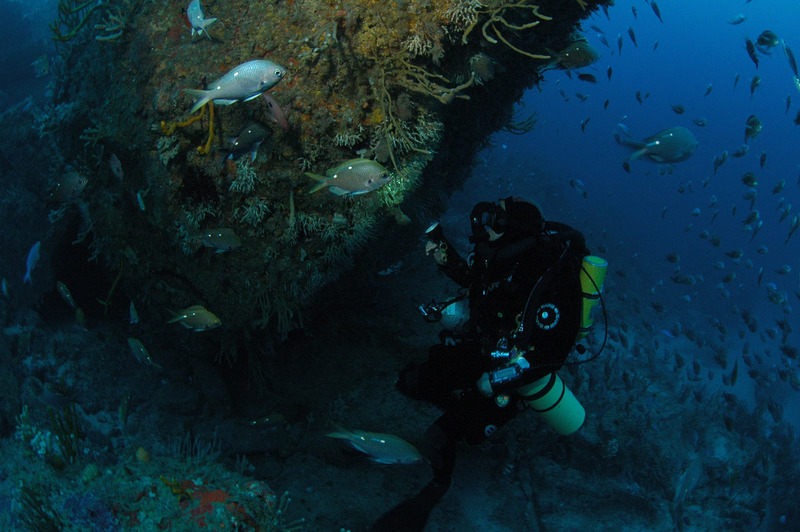 A deep dive can be readily commenced from the usual anchorage just to the north east of the arch. Descending to the bottom at around 15 metres and swimming straight out to sea, the reef drops in a series of steps and a gentle swim has you at 60 metres in about 8 minutes. 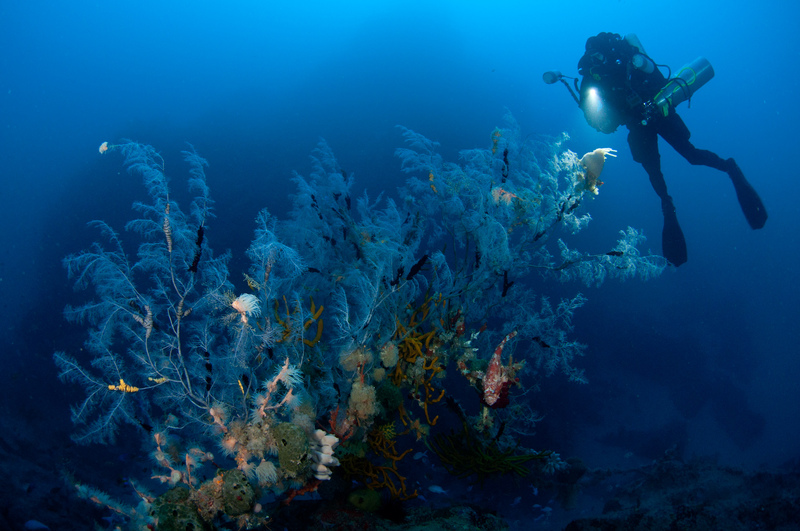 Rocky reef and large boulders tumble down a little further to the white sandy bottom at 65 to 68 metres depth. 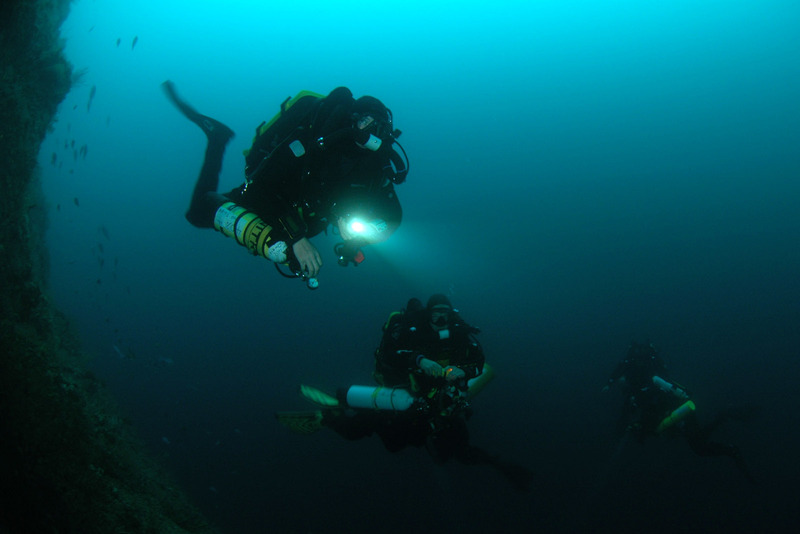 Greater depth can be achieved by heading towards the point at northern side of the Barren Arch inlet. Alternatively, turning towards the south before ascending up through a jumble of large boulders allows deco time to spent inside the arch with its beautiful moody lighting and colourful encrusting life. 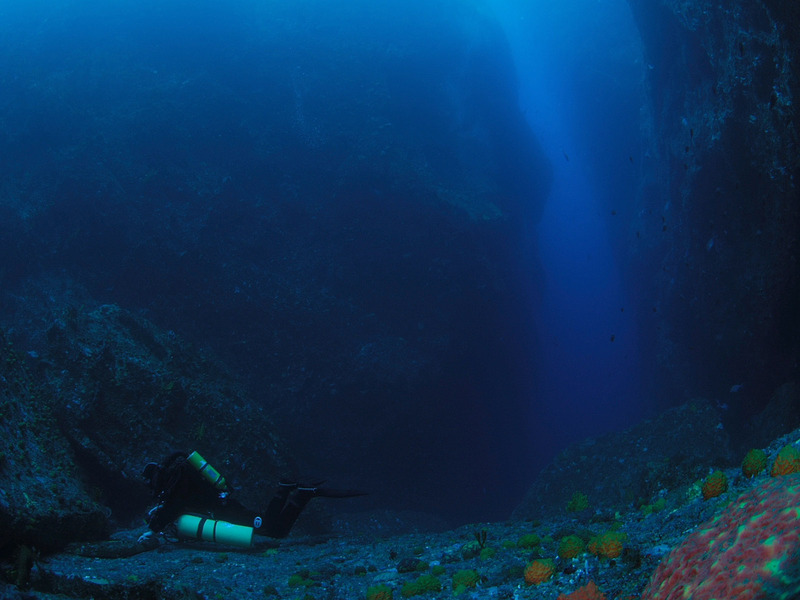 At Ngaroimata Point, the underwater cliff face drops dramatically to nearly 75 metres depth. This is one of the best vertical drops at the Knights and is probably only rivalled by the Sugarloaf and wall outside Light Shaft Cave. North of the point towards Barren Arch, an enormous boulder, the size of a double garage, has an overhanging face at 60 metres depth covered with colonies of white and pink Oculina. 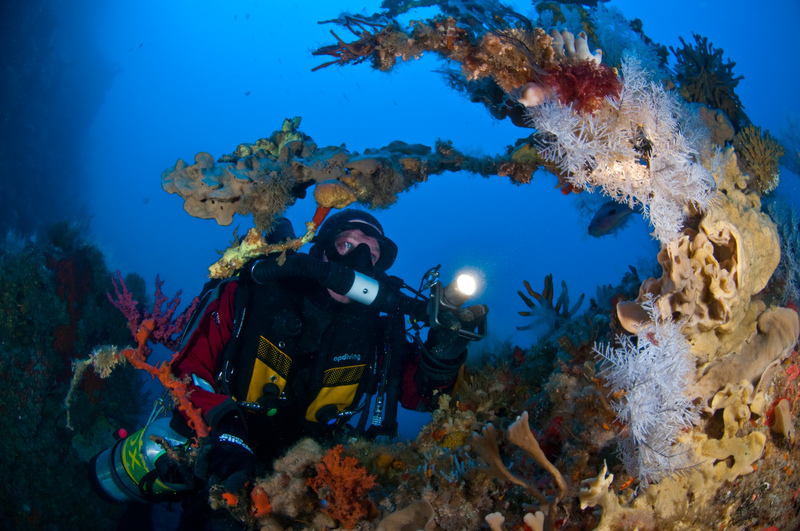 Landing Bay Pinnacle provides a sheltered, easy-to-navigate site with easy access to 60+ metres depth. 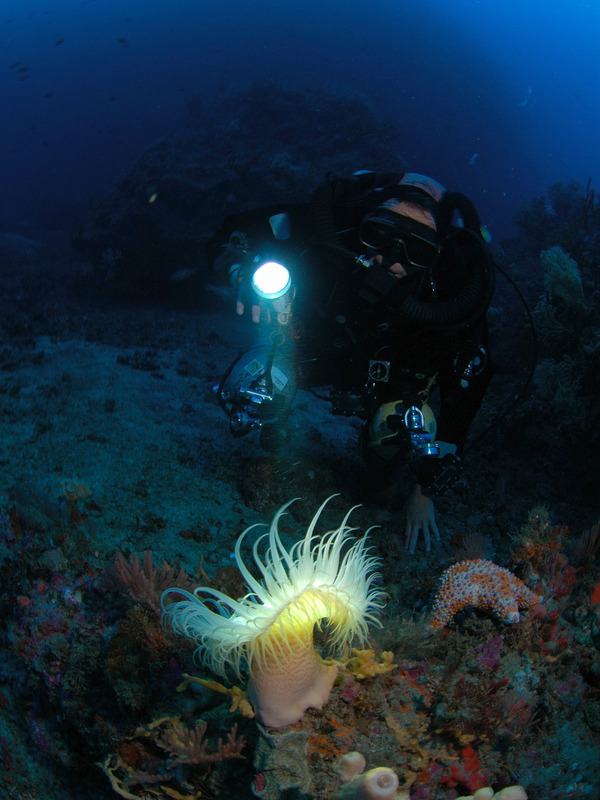 Dropping off the southern side of the pinnacle, you meet the white sandy bottom at around 50 metres. 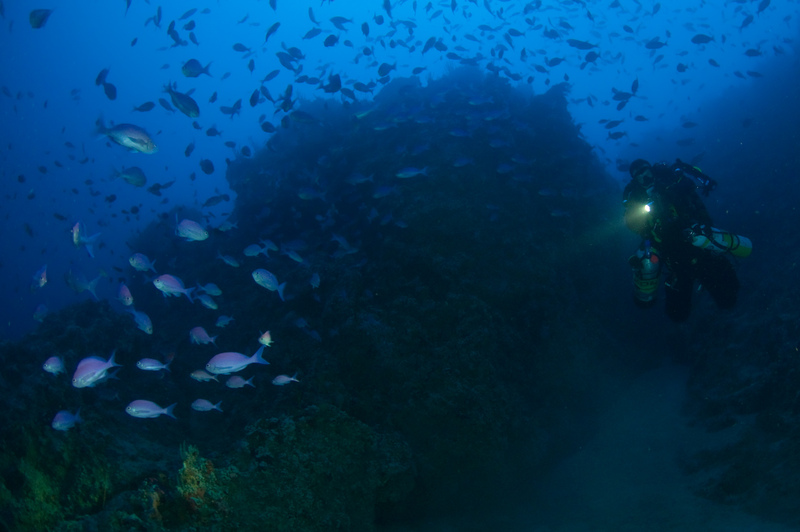 Following the reef-sand line in a clockwise direction, the sand slopes away and at the western flank a vertical wall rises up about 20 metres from the sand at 65 metres. Continuing around, the sand starts to slope up and there is a nice area of broken reef and sand rubble at around 55 metres where we have found the redbanded weever (Parapercis binivirgata) resting on the bottom. This rocky pinnacle rises to within 23 metres of the surface and drops away steeply on its northern side to a sloping sandy bottom at 75 metres. 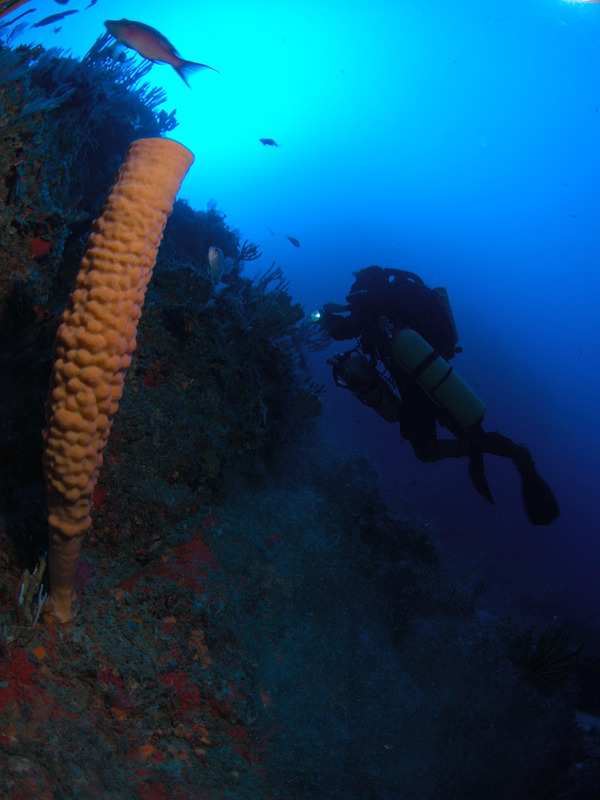 At depth, the walls are covered with yellow finger sponges and the occasional large tube sponge. There are some scattered small black coral trees but they are not a major feature of this area. 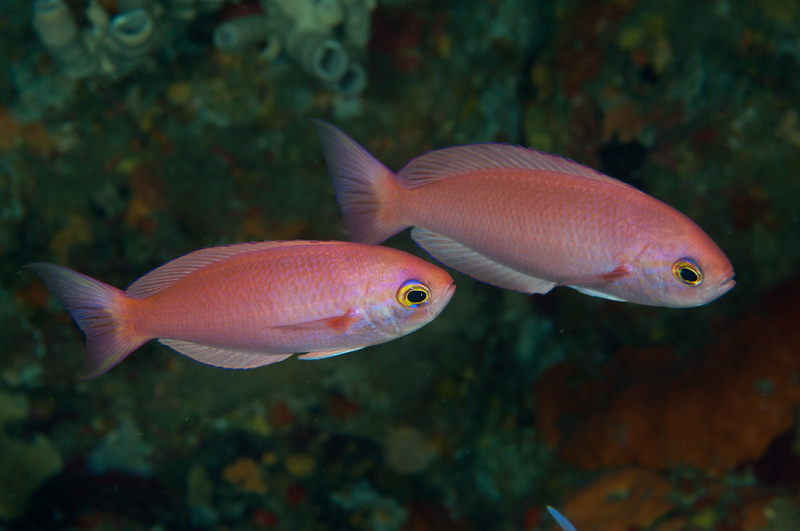 Splendid perch are abundant below 60 metres and school with masses of demoiselles and pink mao mao. At the north western corner, a nice vertical wall rises up 20 metres or so from the sand. 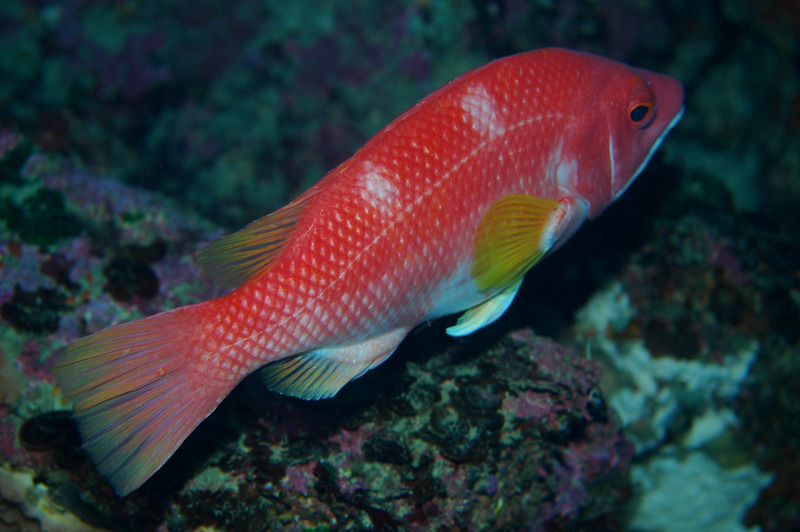 A horizontal slot near its base (at approx 62m) is home to an Eyebrow perch (Hypoplectrodes sp.). 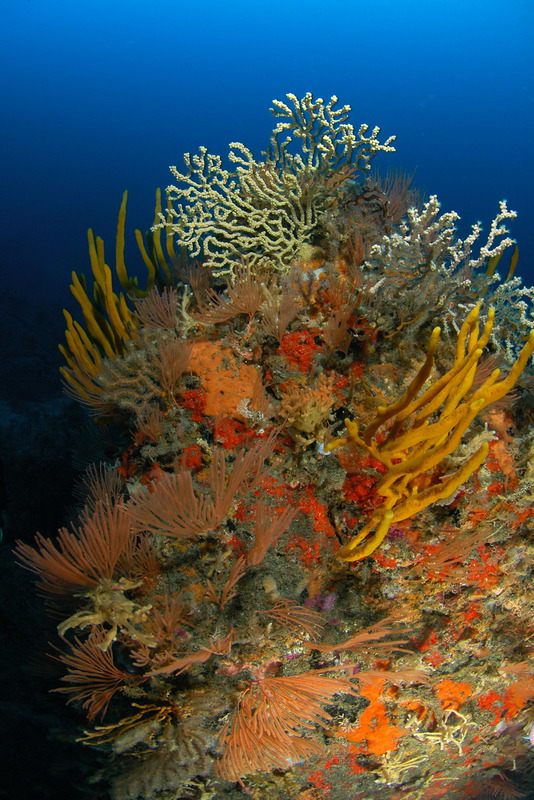 Although not as deep as some other sites, the area has interesting patches of deep water reef broken up by white sand, and is home to beautiful gardens of sponges, gorgonians and black coral trees. On the point off The Canyon, the wall drops steeply to small rocky plateau at 57 metres depth from which a rocky finger extends out onto the sand at 62 metres. The rocks in this area covered with yellow finger sponges and Primnoides gorgonians but the most spectacular feature are the many large organ-pipe sponges (Calyx imperialis). Some of these are up to a metre in height and 300 mm in diameter at the mouth of the tube. A number of black coral trees can also be found in this area. 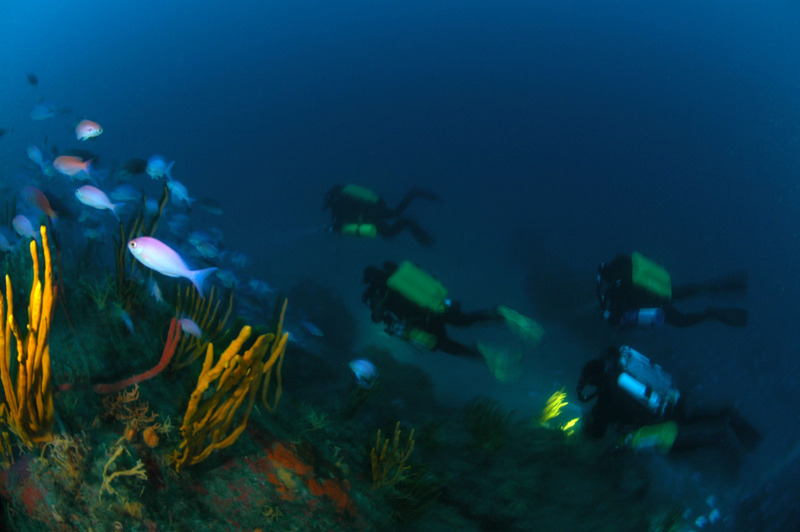 The Canyon itself is a narrow sandy bottomed channel with rocky walls which provides picturesque route for divers during their descent or ascent. 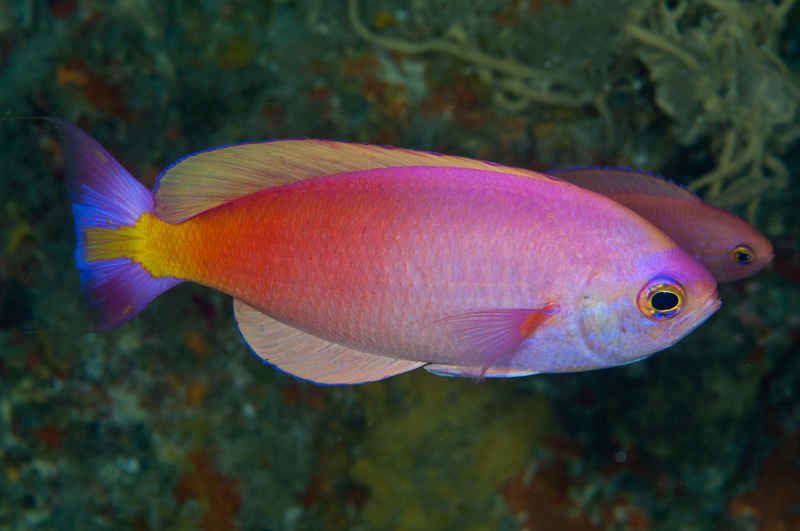 A hapuku (Polyprion oxygenios) has been sighted in The Canyon at 45 metres depth. On the eastern side of Bird Rock the reef drops away quickly to a bottom of steep rocky outcrops separated by patches of white sand. The sandy patches begin at about 55 metres and level off at around 65 metres. 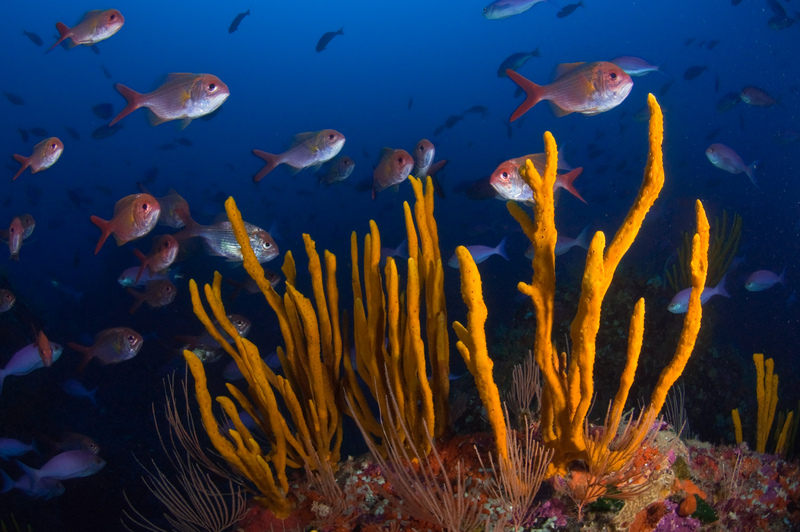 The reef is covered with gardens of sponges, many of which are shaped as bowls or tubes. Foxfish have been seen here at 60 metres. 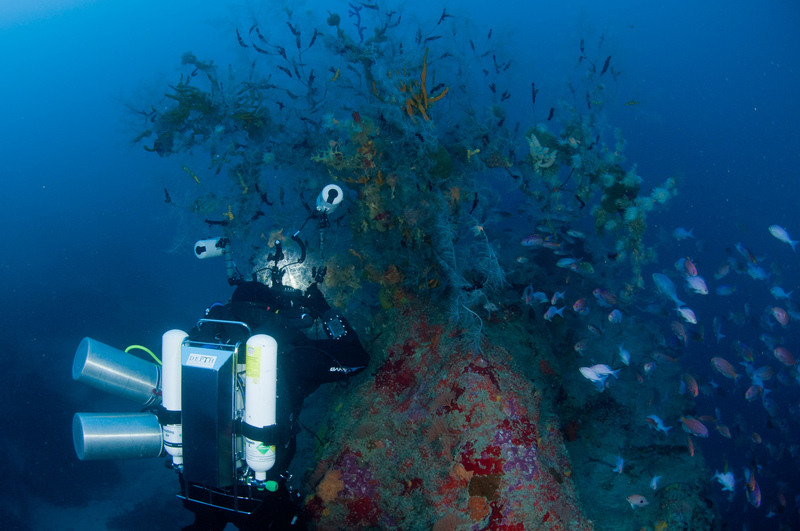 At between 35 and 45 metres depth, ridges project out from the wall creating an increased current flow and encouraging the growth of some of the largest and most beautiful gorgonian fans to be found at the Poor Knights Islands. 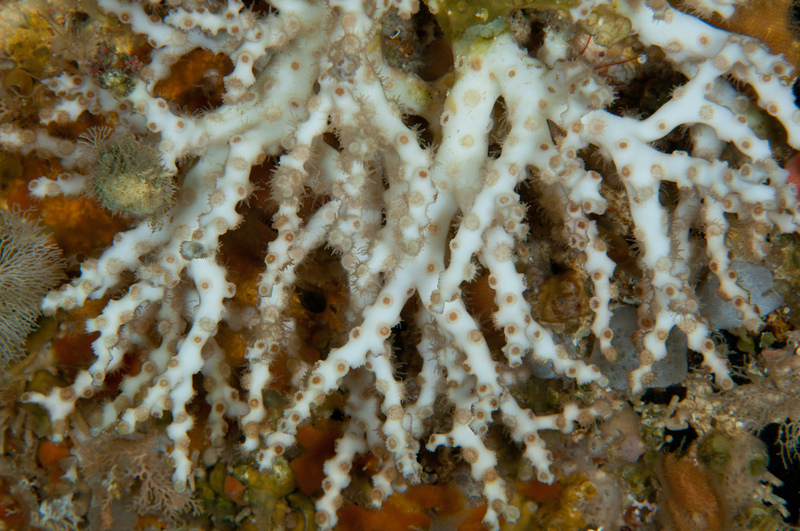 These gorgonian clad walls are very reminiscent of deeper reefs at The Three Kings Islands where the ivory coral, Oculina virgosa is common. I haven't yet found any Oculina at this site but I'm sure there's some lurking down there beneath an overhanging rock face. 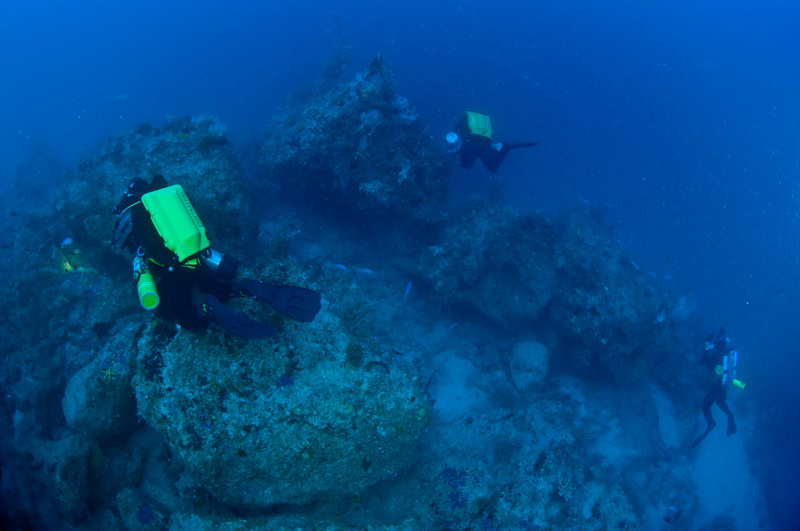 As the point is approached from the north, the reef drops steeply to the sandy bottom at 55 to 60 metres. On the point, large rocky features extend further out and meet the sand at around 75 metres. 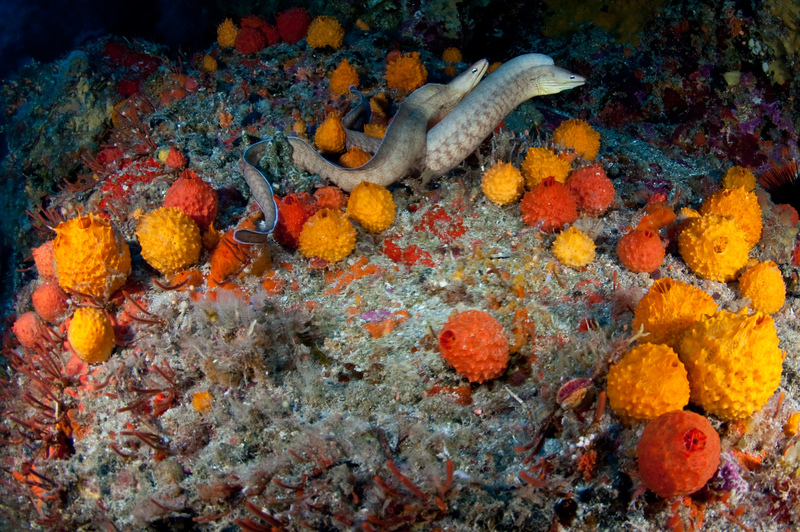 Rocks in this area are covered with yellow finger sponges, gorgonians, and some black coral trees. Strong currents can be experienced at this site. Under such conditions it is difficult to swim around the many small rocky outcrops but there are also plenty of vertical guts which offer shelter from the current. Hunkering down in a gut for your deco may be preferable to over exerting yourself trying to fight the current. At the point, the wall drops steeply to a small plateau at about 40 metres from where you swim out a little before continuing the descent. 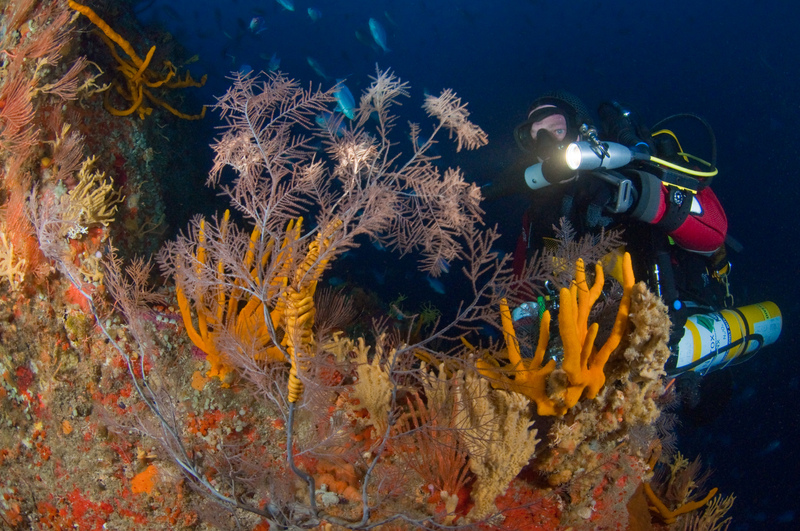 Between two enormous boulders on the edge of the plateau is a large, healthy black coral tree at about 44 metres depth. It's perhaps two metres across and is one of best coral trees at the Knights in this depth range. 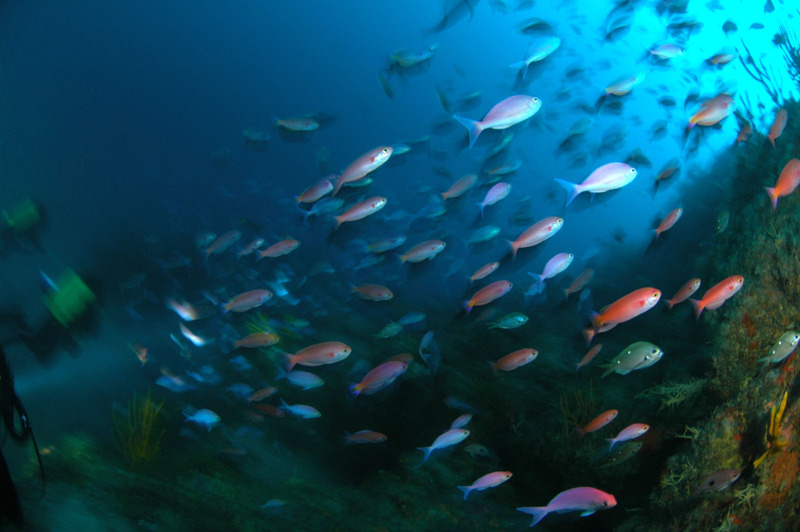 The sandy bottom begins at about 65 metres and gradually slopes away to 75 metres and beyond. The eastern side of the point (heading towards Southern Arch) offers a much more vertical descent to 60 metres which becomes a jumble of enormous boulders in the 60 to 70 metre range. 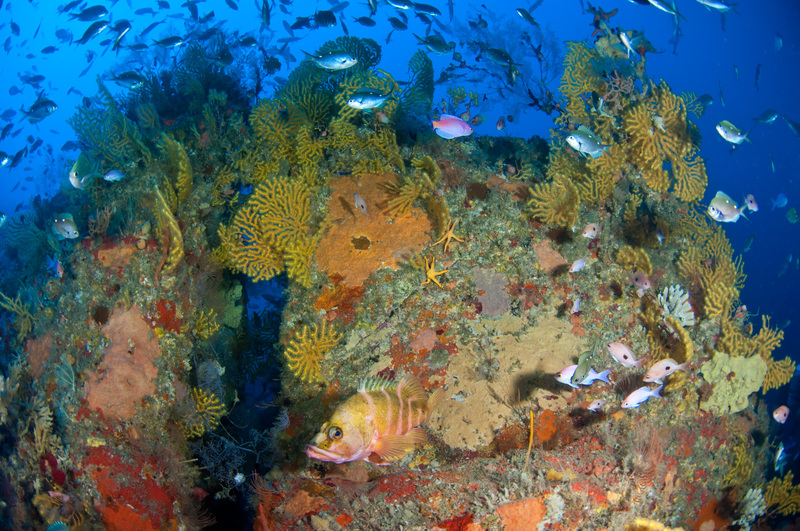 Foxfish frequent this area and some white Oculina has been found here on an overhanging rock face at 65 metres depth. As you head in the other direction from the point, towards Calypso Bay, the descent requires considerably more horizontal swimming to reach 60+ metres. 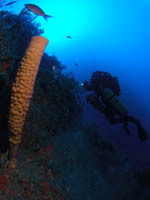 On the deeper parts of the reef, yellow finger sponges and Primnoides gorgonians abound. 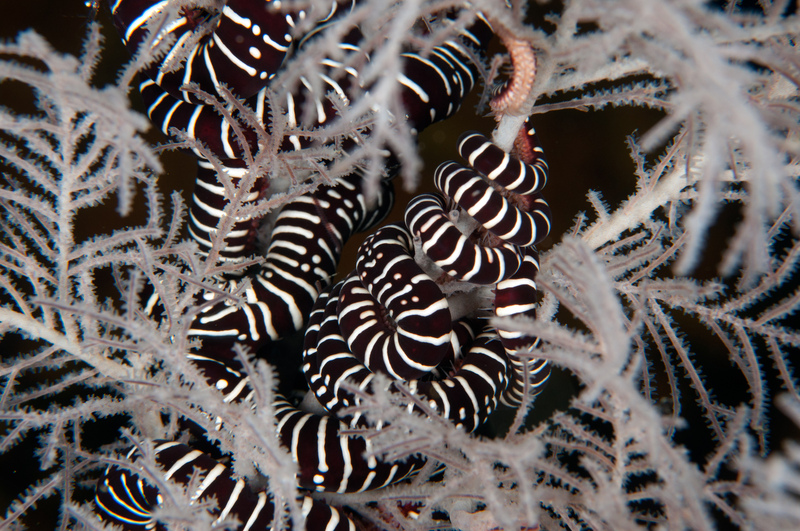 Small black coral trees can be found from 40 metres with some larger trees from 45 to 60 metres. 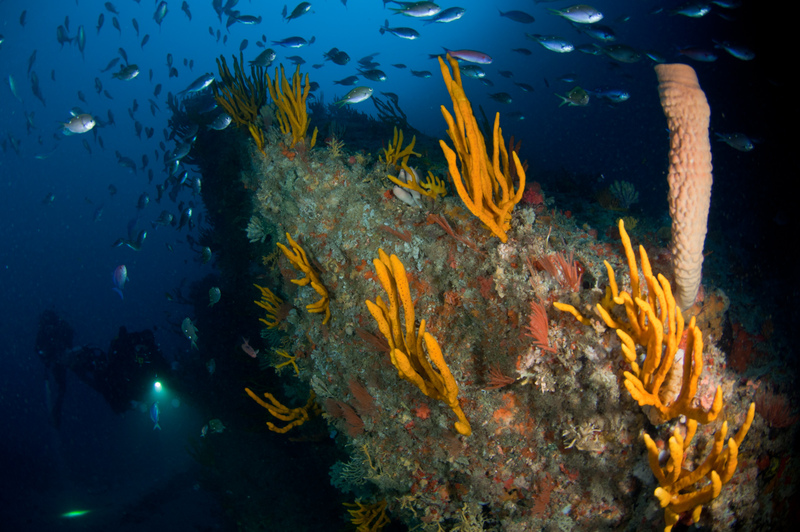 Named after Wade Doak, the Poor Knights diving pioneer and passionate conservation advocate, this area is arguably the best deep dive site at the Poor Knights. 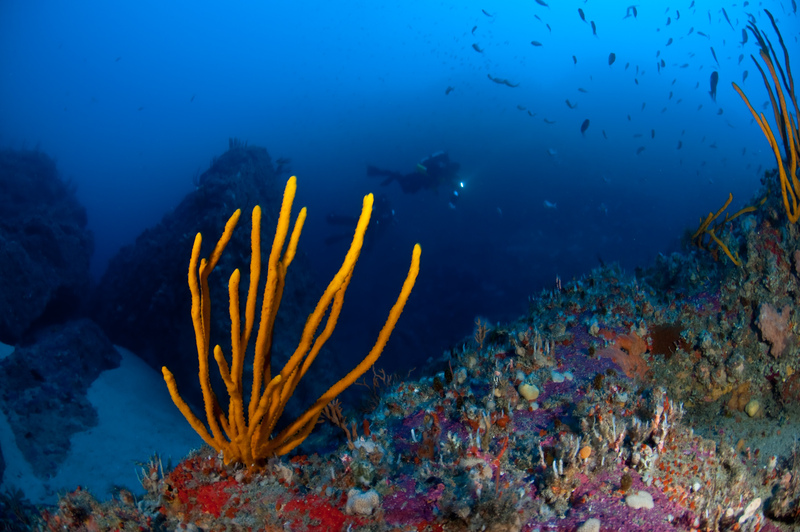 A finger of jagged reef extends out from the island and tumbles down to more than 80 metres depth. 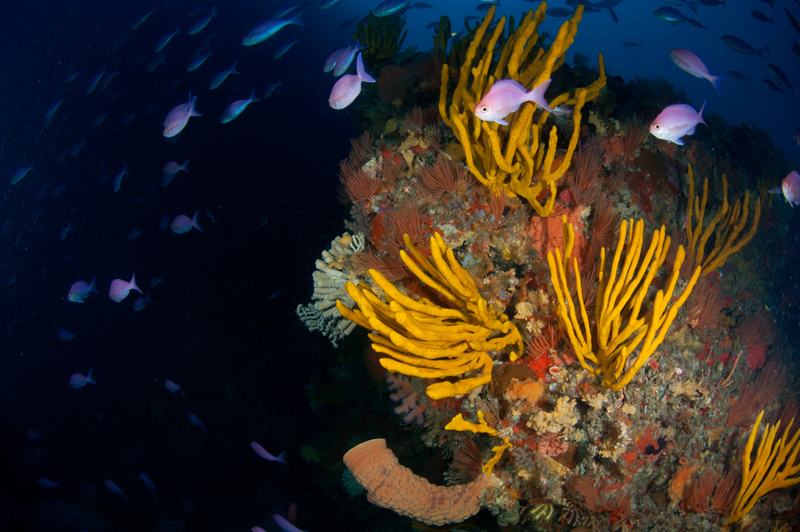 Bathed by nutrient rich currents, the rocky outcrops are covered in black coral trees, sponges and gorgonian fans. 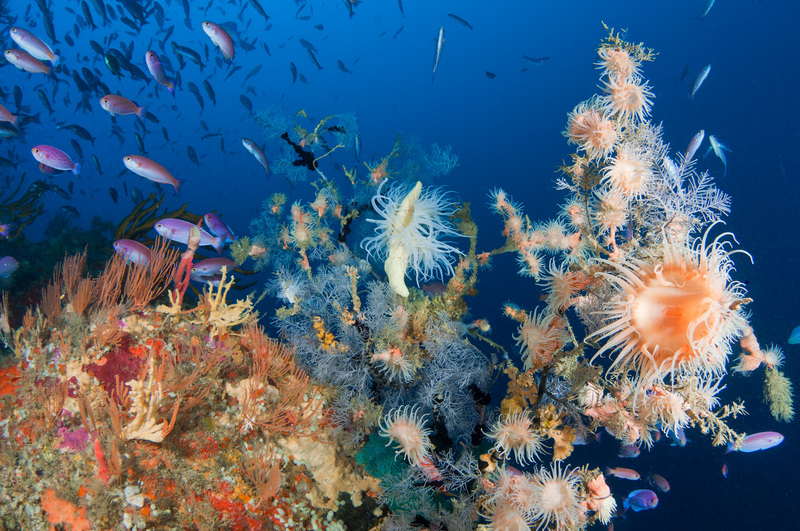 A large, healthy black coral at 62 metres is cloaked in colourful sponges, snake stars, anemones and other invertebrate critters. In several visits over many months, the tree has always had a stinging wandering anemone (Alicia sp.) perched at the end of an upper branch. 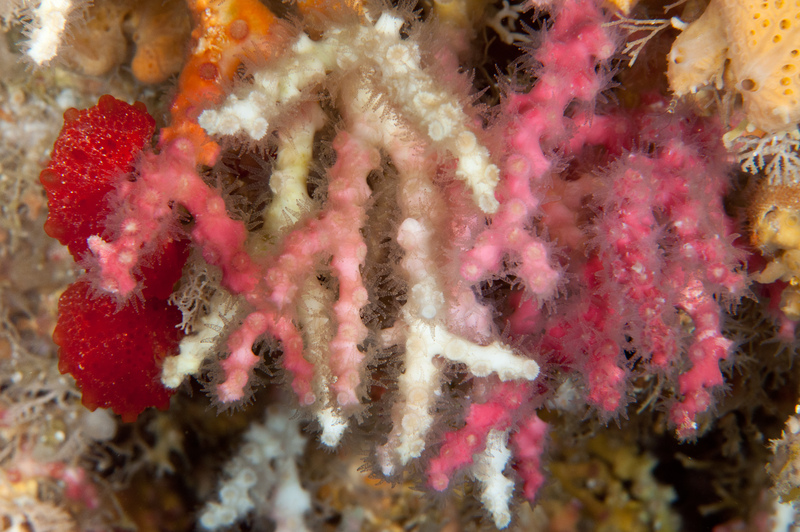 A small black coral tree nearby (also at 62m) has a large clump of pink and white Oculina growing at its base. 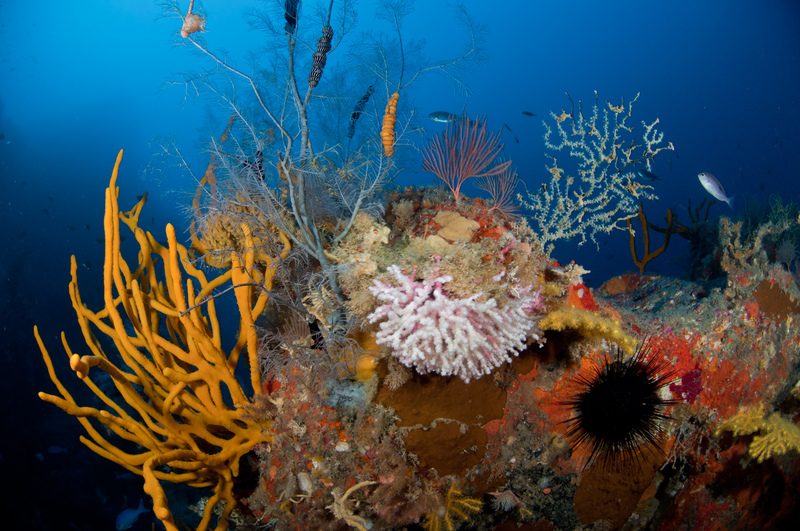 On a dive where we missed the main reef and ended up slightly to to the north, an isolated patch of reef emerged from out of the gloom as we swam down the sandy slope. 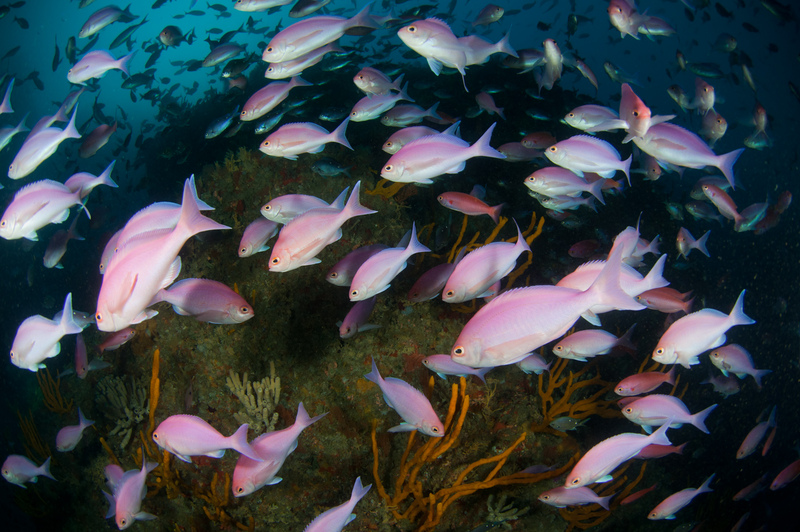 At its deepest point, we found small black coral trees festooned with anemones and surrounded by schooling spendid perch and pink mao mao. An unusual looking growth on primnoides gorgonians at 66 metres turned out to be a spindle cowrie, a creature which had eluded me until then. We call this Little Wade's World. Rocky spires and huge boulders gradually slope away to more than 75 metres. 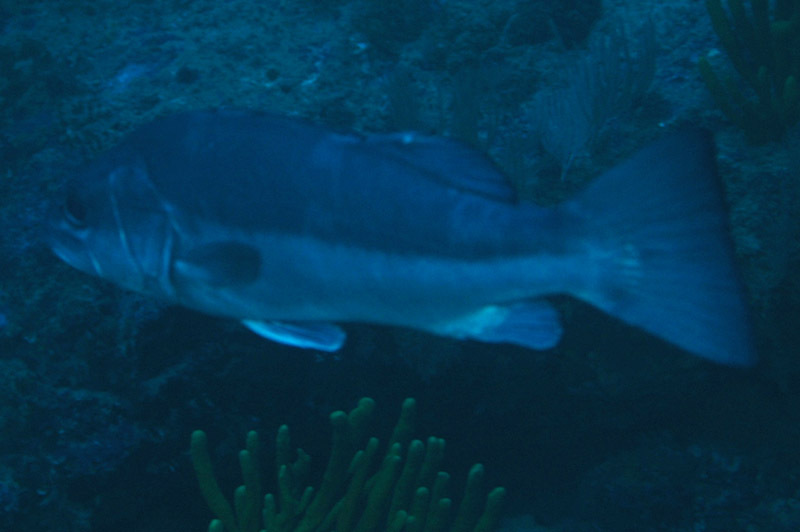 A mid-sized black coral tree can be found at 37 metres off the south-western point. It is a little spindly but a nice specimen considering the relatively shallow depth. At the south-western point, the wall drops steeply to a sandy bottom at about 62 metres. Heading clockwise from the point, the north-western face of the rock has very large boulders tumbling to the sand at about 70 metres depth. 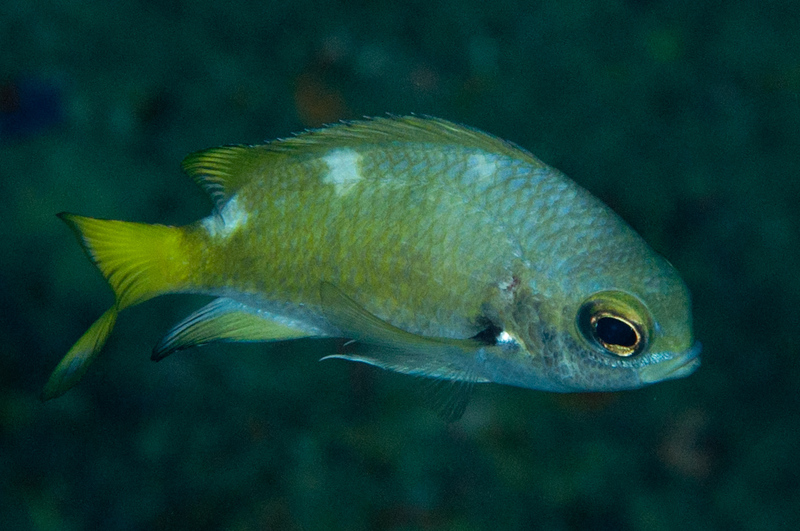 In this area, schools of the Deepsea damselfish, Chromis abyssicola, a deep water relative of the demoiselle can be found. Where the reef meets the sand, I have gazed out into the blue in search of the fabled “Kamikaze drop-off” described in Peter Rippon’s Diver’s Handbook. Unfortunately, it doesn’t seem to exist. 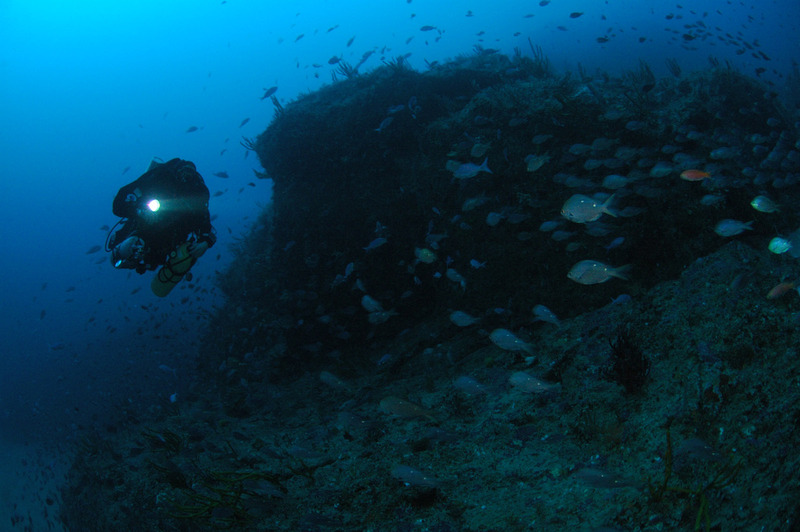 The sandy bottom simply slopes away gradually from 70 metres. The grandaddy of them all, the northern flank of the Sugarloaf yields the Knights' deepest dropoff, plummeting almost vertically to 85 metres before the bottom appears from out of the gloom. 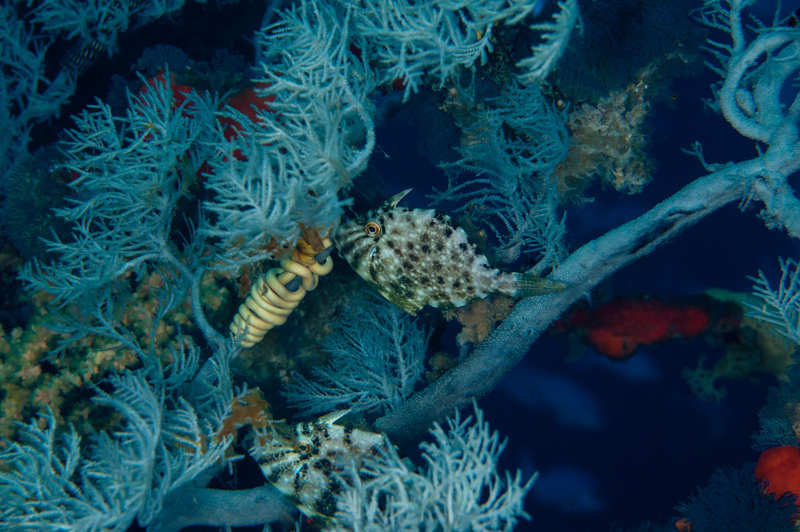 The deep walls are a little barren but there are some small black coral trees and a few clumps of Oculina can be found under small overhangs at around 70 metres. 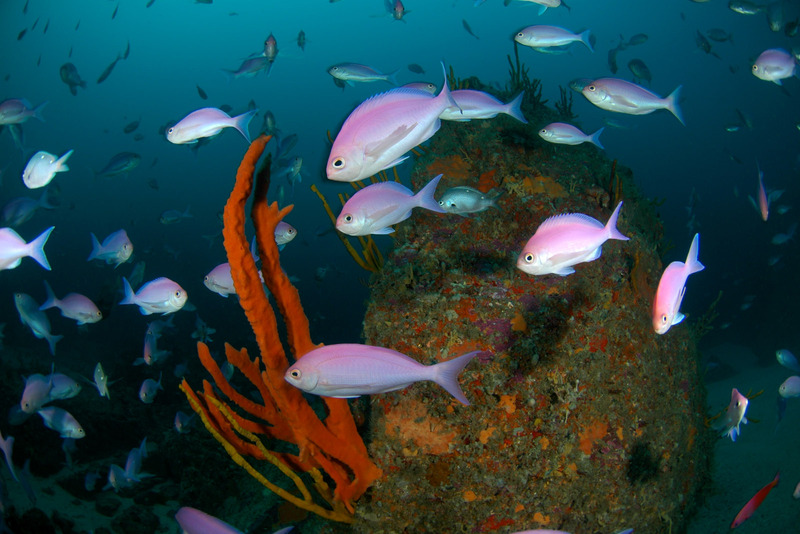 The Sugarloaf is an exposed site requiring good sea conditions. 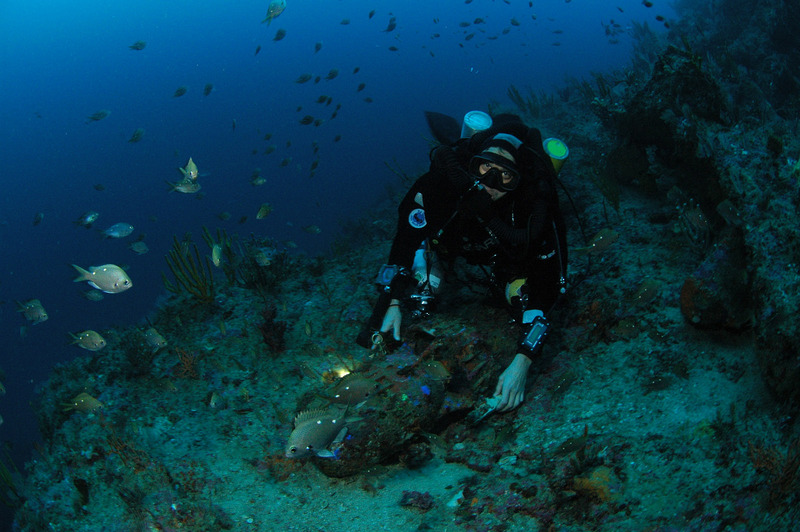 There is often some current around the rock but this can be easily handled by swimming with it until it drops off. Current tends to be more pronounced at the eastern and western points where fish life aggregates providing a good opportunity to see bronze whaler sharks.